In regards of the Tower One the wait has come to an end. 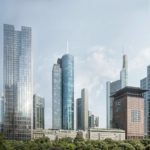 In a statement today, the Austrian real estate company, CA Immo announced the erection of a 190-meter office and hotel high-rise building in Hochhausmetrole, Frankfurt with tower “ONE” (project name: Tower One Frankfurt). 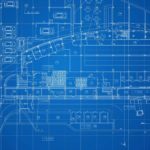 Construction is still due to begin in summer, finishing around the beginning of 2021. A long-term lease agreement with the NH Hotel Group – which will operate a hotel with the lifestyle brand, Nhow, with 375 rooms from the outset – has already been signed, as the CA Immo announced. In the 49-storey building with a gross floor area of ​​around 85,000 square meters, the four-star superior hotel will occupy 14 floors at almost a third of the area. Two other storeys are designed as co-working areas. Furthermore, the construction of around 600 bicycles and 470 parking spaces is planned, 24 of them with an electric charging station. The planned high-rise is located in the Europaviertel right next to the Tower 185. How do you find the architecture of the tower ONE? The view restaurant in the new Henninger Turm is to open somewhat later than planned. According to operator, Mook Group, the opening was originally planned for the middle of the fourth quarter of 2017. The opening of the viewing terrace, on the other hand, was accounced to take place earlier: from the end of September 2017, visitors were proposed to see the perfect view of the Frankfurt skyline from the 38th floor. Status January 2018: The restaurant has still not opened. According to newspaper reports, it is not yet clear when the opening will take place. 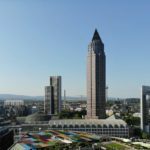 Status May 2018: An insider tells the Skyline Atlas that the planned restaurant in the head of the Henninger Turm will not open until late summer 2018 due to “ongoing construction work”. Access will then be possible via a separate entrance area/own elevator. Status Autumn 2018: The restaurant has been opened. What are the top reasons when you think about the new restaurant in the Henninger Turm? Great, finally a restaurant at this point with skyline views. Uh-oh, this will probably be a location for best earners. I'm looking forward to the map and the location. In 2014, the AfE tower, a high-rise building of the Goethe University, was blown up by two controlled explosions. Thousands watched as the tower collapsed. Thanks to the confusing elevator system and the concrete architecture, the tower was not popular with many. Now, three years after the explosion, the AfE tower has been honoured in the science fiction short film, “Rakka”. 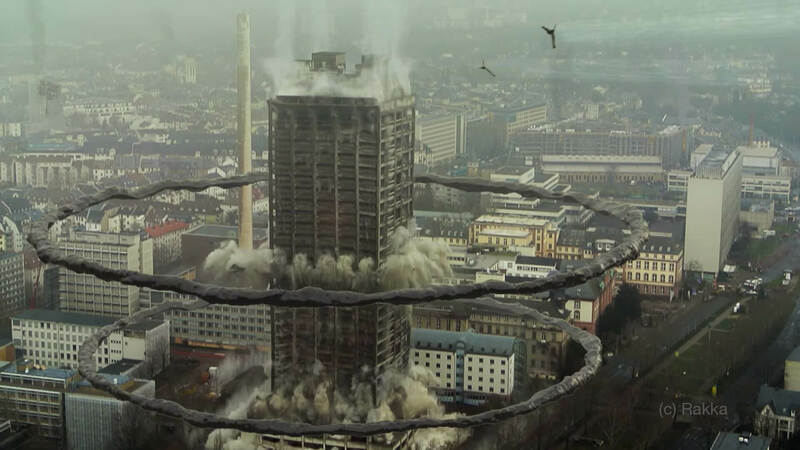 Director, Neill Blomkamp – ​​who became famous with his social-critical alien thriller ‘District 9’ – captures the fall of the AfE tower (from minute 1:24) in his latest postapokalpytisches Machwerk. In the movie, “Rakka” aliens have subdued mankind in 2020, kept them captive as slaves and fed them to their children. At the end of June 2017, there is now a green light for a project of the investor, Michael Dietrich, who, according to the plans of the architect, Christoph Mäckler – along the Berliner Strasse in Offenbach – will build a complex, consisting of two buildings. 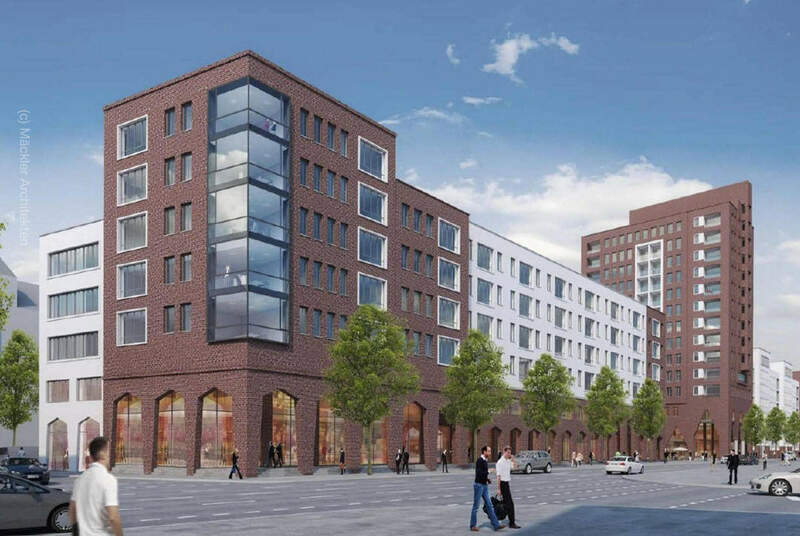 The project will be built on the site of today’s Toys’R’Us Centre, directly at the Offenbacher Marktplatz. The high-rise building in the middle of the new complex marks a quarter square, which in turn forms the entrance to a footpath to Ziegelstrasse. The planned high-rise is to have 14 floors and serve residential purposes. Construction on high-rise buildings at the Kaiserleikreisel (‘Kaiserlei ring road’) has just begun. At this point, the CG Group is setting up an ensemble of residential buildings that include, among other things, the former Siemens high-rise buildings, which are to be converted into a “vertical village” after extensive modernisation. 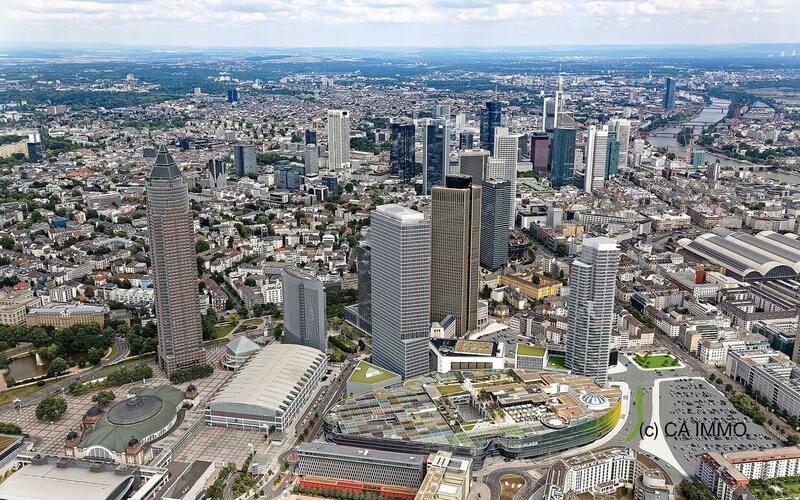 Frankfurt is finally deciding to expand in order to allow for further growth of inhabitants, with a new city district now revealed. Mayor Peter Feldmann (SPD) presented the proposal of the Roman coalition of CDU, SPD and Greens for the location of the new district. 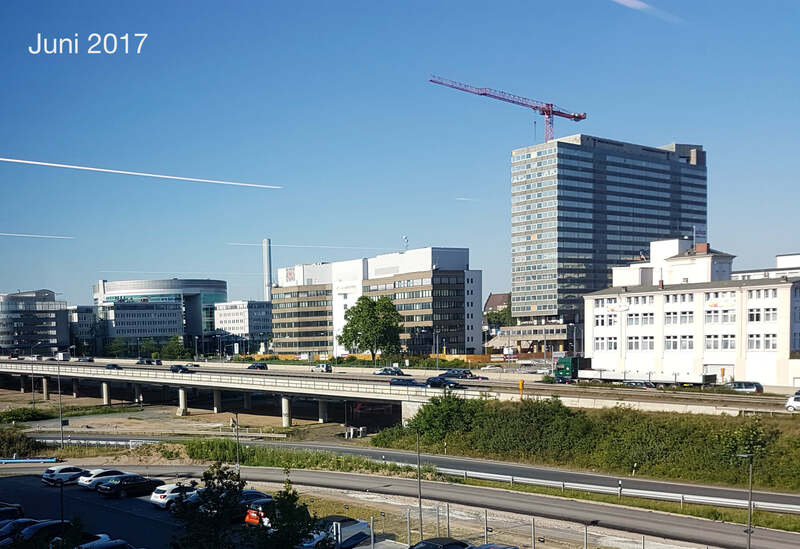 In the west of the Frankfurt city area, the new district could be built on a 550 hectare area on both sides of the A5 motorway. The area would be adjacent to the suburbs of Niederursel and Praunheim and end at the city boundaries of Eschborn and Steinbach. Of this some 190 hectares of building land, according to the city of Frankfurt, between 8.550 and 11.400 new apartments can be created. Further studies on the construction site provision are to follow, announced planning director, Mike Josef. This is also to keep land prices at the current level to prevent speculation. In the meantime, numerous reservations have been voiced, as is often the case with such projects in Germany. In particular, the FDP in Steinbach reacted negatively to the plans. The politicians in Steinbach see no chance there, but want to preserve old areas. It does not recognise that cities are developing further: villages will become settlements, villages will become municipalities, municipalities will become cities and cities will become metropolises. 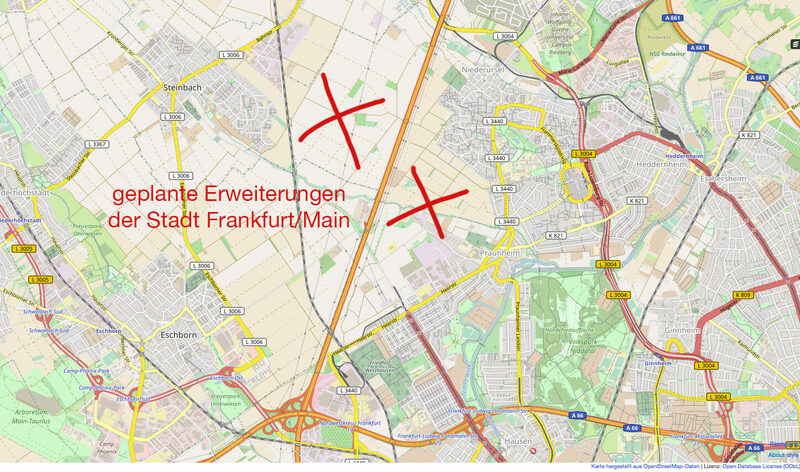 In this sense, a dense, lively district with a potential to stay long-term would have to be created in Frankfurt West. Please do not just row houses and a sleeping town – there are already enough in the surrounding area! A further development of places was met and applies to all municipalities. Steinbach cannot escape this development in terms of Frankfurt’s new district. Especially in metropolitan areas, urban and community boundaries become increasingly irrelevant because people experience the region as a whole: you live in Steinbach, go to the cinema in Eschborn, visit festivals in Frankfurt or wander through the Odenwald. Steinbach is just like Frankfurt Rhine-Main, as Eschborn belongs to Dreieich. Without Frankfurt, Steinbach would be nothing. Without Offenbach, Frankfurt would be worse. This is what people really feel! Administrative boundaries are a relic of the last century and have less and less to do with our networked reality and Nbsp; we should all be happy when progress and development enriches our lives. 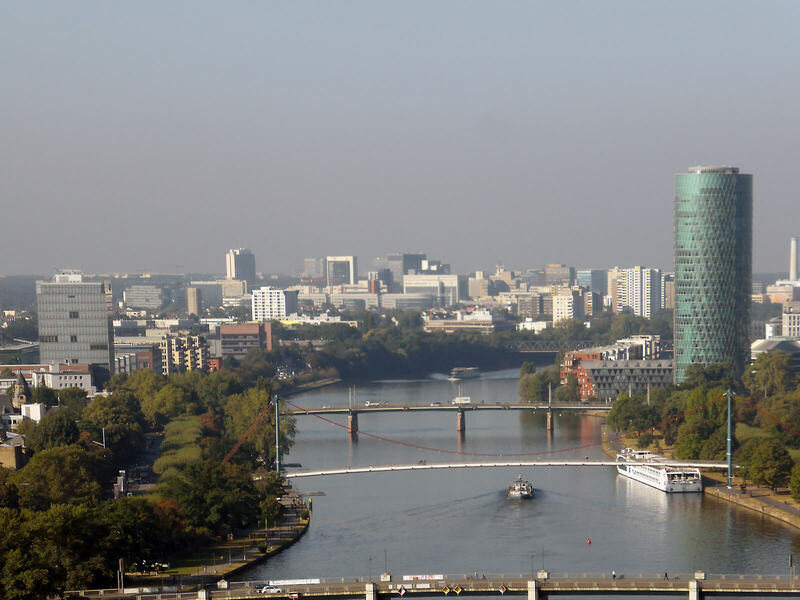 However, the development of the Frankfurt region should not only take place on a selective basis in the Frankfurt West, but also in other locations. If one travels with the S1 from Offenbach to Frankfurt, for example, one actually goes past vegetable fields (!!!! ), not near the ECB. One wonders, why is it not possible to create housing, workplaces or at least park and play facilities, which can then also be used by the growing population. We can grow vegetables outside! Phorio: The cities of Eschborn, Steinbach and Frankfurt. You’re looking for ‘new high-rises in Frankfurt?’ Then you’ve come to the right place! In the Skyline Atlas, all new high-rise projects are presented in Frankfurt, not just with individual texts and pictures. Rather, the editorial team provides specialist information for architects, engineers, real estate companies, the general public and ‘high-rise fans’. For a long time the construction of tall buildings in Frankfurt was controversial. During the Frankfurt Housing Fights (“Frankfurter Häuserkampf”) in the early 1970s, even shameful names emerged as the epitome of a city map, which promoted investor interests to the detriment of the old-established population. Since the 1980s, ever higher and more beautiful high-rise buildings were built and new towers emerged here. The Frankfurt skyline became a symbol of the city, and of prosperity and future orientation. The population increasingly identified itself with the skyline, which became a huge part of the image for the banking city. Since 1996, the ‘Skyscraper Festival’ has also been celebrated at irregular intervals, once initiated by the former Lord Mayor Petra Roth. So what does Frankfurt look like today? In 2017, Frankfurt will have a new beginning. More and more high-rise projects are under construction or are being planned. 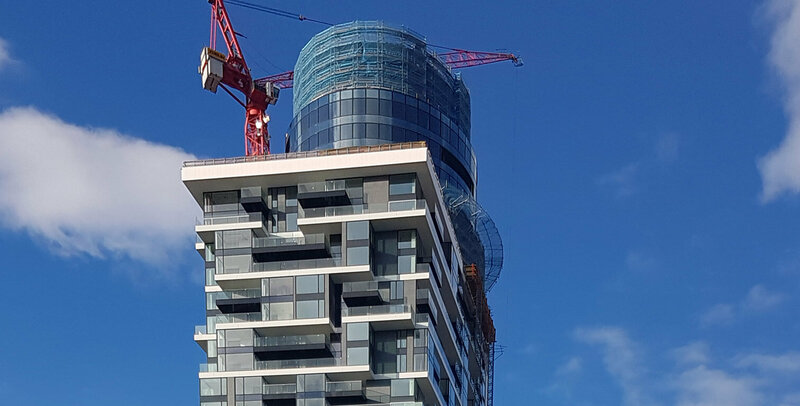 As of October 2017, 16 high-rise buildings are already under construction, with a further 26 high-rise projects announced. The high-rise buildings are also getting taller and taller here. Frankfurt has now crossed the ‘critical mass’ of necessary high-rise buildings, so a cluster formation at several locations is now perceptible.